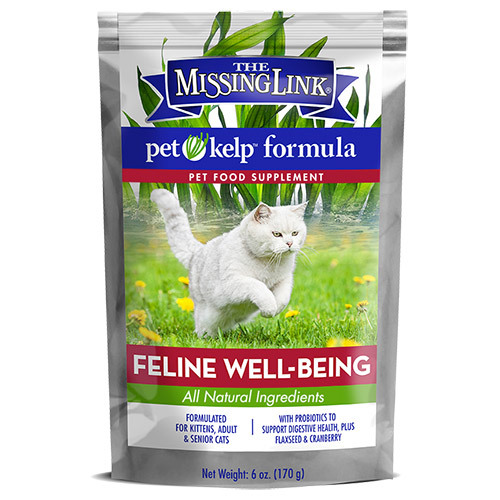 The Missing Link Pet Kelp Feline Wellbeing blend combines organic kelp, flax, cranberries and probiotics to support your cat`s health, hardiness and overall wellbeing. Does your feline friend need an immune and digestive system boost? With The Missing Link Pet Kelp Feline Wellbeing blend, add a daily scoop of beneficial bacteria to your kitty’s digestive tract with the natural goodness of organic kelp, flaxseed, antioxidants and probiotics. Organic Dried Kelp (75%), Organic Flaxseed (15%) (source of omega fatty acids), Organic Cranberry (4%), Dried Lactobacillus Acidophilus Fermentation Product (1%). 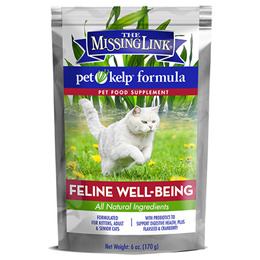 Below are reviews of The Missing Link Pet Kelp Formula - Feline Wellbeing - 170g by bodykind customers. If you have tried this product we'd love to hear what you think so please leave a review.